Exclusive Interview: John Rhys Davies Talks War of Resistance, Indy 5 + Returning to The Hobbit? Last week, I got to speak to a man who has been in some of the most well known films of all time and who I’ve admired watching on the big screen for over 30 years. 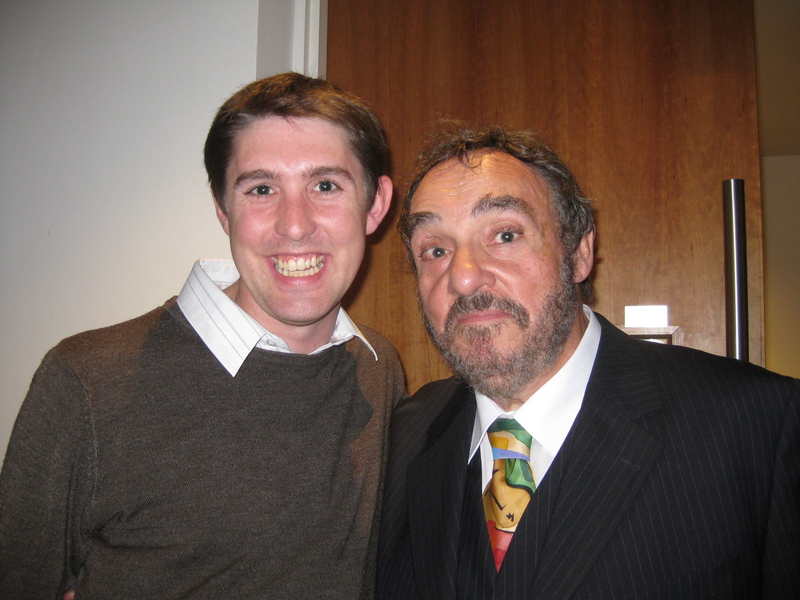 That man is John Rhys Davies who has starred in Raiders of the Lost Ark, The Lord of the Rings Trilogy and who can forget Solomon’s Mines! John has a new movie coming out next week called War of Resistance, which details the story of a group of Dutch resistance fighters in the second World War. I spoke to him about his new role as Eusi, a priest trying his best to hide from the Nazis in a safe house during the war. I couldn’t resist asking him about working with the likes of Steven Spielberg & Peter Jackson, and I certainly couldn’t help but inquire as to whether or not he’d be appearing in either of The Hobbit movies. Read on to find out more! I think you might like what you find! HeyUGuys: What was it about War of Resistance that attracted you to it? John Rhys Davies (JRD): As usual, someone approached my manager, and what appealed to me was the fact that it’s based on real heroism. I like heroes, and would like to be a hero myself. I suppose we all want that. When you think about it, imagine having the chance to help people that weren’t normally the people that you wanted to associate with, or had associated with, but didn’t share the same values you have. Imagine that if you do so, you run the risk of losing your life, that of your husband’s, your wife’s or your child’s. I wonder if we wouldn’t just keep our heads down in these circumstances. There are some people who feel morally impelled to protect the vulnerable. The heroism of the Christian community in Holland at this particular period is one of the golden moments of Western civilization. “I’ve changed, I’ve changed utterly”. The second World War is one of those very clear instances of us being in the right war at the right time with the right enemy, and achieving complete success. Nazism as a force in Europe was defeated definitively. You get the odd freak episodes like that which happened in Norway the other day, and these are the results of derangements. There is no articulate and rational political philosophy there. There may be some manifesto to draw people’s attention, but as a force, Nazism was destroyed, and that is one of the greatest achievements that our nation can be proud of. HeyUGuys: In the War of Resistance, there is a a scene where you’re hiding in a room with numerous other people, were you actually in that cramped space or was there a set designed for it? JRD: We were in a place where they had actually done that. You don’t have to be that imaginative to feel that terror and empathize with the people who were in that position. Many years ago I did something called War and Remembrance, which was a mini series in which I played an inmate of Auschwitz and we actually shot it in Auschwitz itself. It was one of the more depressing periods of my life. I would get up in the morning and would have my breakfast. Afterwards, I would get into my silk underwear and I would put my costume on in the hotel and would then drive through the gates of Auschwitz in my chauffeur driven car only to play one of those people who passed through those gates. You had the sense of two million people looking at you, two million ghosts and feeling their utter contempt and bewilderment for what you were representing and trying to be; how inauthentic you were. It’s impossible to imagine evil on that scale. We see evil (like this little boy in Norway manifesting itself on that small scale and we can pardon it because of it’s clearly psychotic origins. But when you come to 3 millions Jews, 2 million Poles, 2 million Czechs, 2 million Russian soldiers etc. etc. etc., the scale of it beggars belief. And of course you have murders by Stalin and Pol Pot, which were perhaps greater in number. I mean some of these people have such an inexhaustible capacity for murder that their lack of empathy, their lack of humanity, creates a vision of bleakness in their empty souls which is possible more terrifying than the torture and the extermination camps themselves. I’m still capable of being surprised and shocked by human nature. HeyUGuys: Where was the movie shot and what was it like working with the new young cast? JRD: They shot a lot of it in America, but my scenes were shot in Amsterdam in Holland. They’re all very young, very new, but so good! They represent that school of young American actors who take their craft very seriously, sometimes too seriously, but then that’s the way to be at the beginning of your career. They inhabit the characters wholly. It was a joy just to meet them. HeyUGuys: I know you must get asked this all the time but I have to ask you about Indiana Jones. You weren’t in Indy 4, did they ask you to be in it and is there any chance we may see you in Indy 5 if there is one? JRD: (Laughs) If I’m asked, I will consider! They did ask me to do a little cameo on Indy 4 actually. It was going to be shot a green screen studio. I was going to sit down and then it would cut it into the wedding or something like Indy getting an award or something like that. I thought the character of Sallah is worth more to the audience than that. HeyUGuys: I completely agree. Every scene we see you in are some of my favourite scenes. Scenes like the one with you punching a Nazi through the newspaper while rushing Martin Brody off into the van and watching him drive off with the Nazi logo on the back are priceless moments! JRD: Yes they are and he’s a great character, but times have changed you see. The Egyptian with the golden heart, warm and generous and outgoing; the image of the Arab world and ‘The Arab’ has changed in America since 911. Perhaps it’s not possible to have a Sallah again. Watching Steven grow and change as an artist has been fascinating. There is an innocence and a light-heartedness that is born basically of lack of understanding of history that continues up to Raiders of the Lost Ark. But when you get to other deeper things like Shoah, and Schindlers List, his deep experience of Nazism, the nature of evil, and his own understanding and knowledge deepens. As a result, his ability to laugh at the Nazis fades. Nazi’s can’t be comic for him anymore, he knows too much now; he has lost his innocence. HeyUGuys: Other than The Hobbit (which I’m sure you’ll get in!! ), what else do you have coming up this year? Well, it’s remotely possible. I don’t deserve to, having turned it down, but it sure would be fun. All I can say is if every film I’ve been offered gets made this year, I’ll be very busy indeed. At the moment we’re living in such extraordinary financial times, I’m not sure anyone can look 3 weeks down the road to know what’s going to happen. Thanks so much to John for his time. War of Resistance is released on DVD the 22nd August.